Specifies whether to use a strikethrough line for a text object. strikeObj = Strike() draws a single, horizontal line through text. strikeObj = Strike(type) draws a line of the specified type through text. Strikethrough text, returned as an mlreportgen.ppt.Strike object. Option to use bold for text, specified as a logical. To make text bold, set this property to true or 1. Setting the Bold property adds a corresponding mlreportgen.ppt.Bold format object to the Style property of this presentation element. Removing the Bold property setting removes the object. Default font for text in column, specified as a character vector. Specify a font that appears in the PowerPoint® list of fonts in the Home tab Font area. Font family for complex scripts, specified as a character vector. Specify a font family for substituting in a locale that requires a complex script (such as Arabic or Asian) for rendering text. Font color, specified as a character vector. Use either a CSS color name or a hexadecimal RGB value. For a list of CSS color names, see https://www.crockford.com/wrrrld/color.html. To specify a hexadecimal RGB format, use # as the first character and two-digit hexadecimal numbers for each for the red, green, and blue values. For example, '#0000ff' specifies blue. Option to use italics for text, specified as a logical. Set this property to true. Setting the Italic property adds a corresponding mlreportgen.ppt.Italic format object to the Style property of this presentation element. Removing the Italic property setting removes the object. Display of text as a subscript, specified by a logical value. A setting of true (or 1) renders text as a subscript. Display of text as a superscript, specified by a logical value. A setting of true (or 1) renders text as a superscript. Type of underlining for text, specified as a character vector. Setting the Underline property adds a corresponding mlreportgen.ppt.Underline format object to the Style property for this element. Removing the Underline property setting removes the object. You can specify one of these types of underlines. A CSS color name. See https://www.crockford.com/wrrrld/color.html. An RGB value, using the format #RRGGBB. Use # as the first character and two-digit hexadecimal numbers each for the red, green, and blue values. For example, '#0000ff' specifies blue. 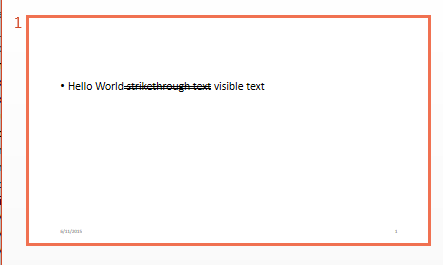 Create a paragraph and append text with strikethrough formatting. Create text without strikethrough formatting and append it to the paragraph. Add the paragraph to the slide and close the presentation.